Back in 2012, Boatdealers.ca reviewed Ranger Tugs’ model R-29 which was at that time the largest of this Pacific Northwest boatbuilder’s four models. Skip ahead four years to 2016 and the all new R-29S, subject of this year’s review is one of eight models from twenty-one to thirty-one feet. That’s four new models in four years. A one hundred percent growth in number of models offered. Quite an accomplishment from a relatively small manufacturer. And the R-29S is indeed all new including the hull, deck, topsides, cabin layout, and even the cockpit and transom. Of all specifications and capacities, only the beam on this new 29 remains the same at an even ten feet. The “S” designation in the model descriptor refers to “Sedan” as opposed to Ranger Tug’s sister model R-29CB which is a “Command Bridge” model with upper and lower helms. But with this new model R-29S you may not even want or need the most obvious advantage that the CB model offers, that being the 360-degree surround sightlines from the upper bridge. The reason for this is that what has most visually obvious and practically changed in this Ranger Tugs newest sedan has totally opened up the visibility from the single lower helm with almost full-surround cabin windows including a curved front window which extends around and down the sides over half the length of the cabin. In addition, Ranger Tugs has created what it calls “an overhead glass atrium” in the hardtop over the helm area consisting of multiple clear “windows” covering virtually the entire hardtop. Two of these are opening screened hatches. The balance of the cabin sides plus almost the entire aft cabin bulkhead consists of windows including the full height of the hinged cabin entry door. There are another two opening screened hatches in the hardtop over the salon plus another similar pair in the overhead cockpit hardtop plus another similar pair in the foredeck above the forward master stateroom. Virtually complete surrounding and overhead glass offering visibility, natural lighting, plus ventilation. It is truly gorgeous. In this new interior layout, the double-wide helm seat flips over to form the forward portion of the four-seater, starboard-side dinette which then can be converted into a double berth. With the large and high rear cabin bulkhead hinged window lifted up to a horizontal position, the aft double-wide dinette seat may then itself be flipped to a rear-facing position to serve as additional cockpit seating. Side cockpit fold-up seats plus the double-wide transom seat along with a standard cockpit table then create a full cockpit entertainment area complete with a standard starboard side sink and a port side refrigerator. The transom seat also flips over to create an aft facing seat over the standard swim platform which has built-in protective fenders along its aft edge plus a swim ladder. Incredible foresight of design and flexibility in such a relatively small package! The R-29S sleeps six in three separate areas; the aforementioned dinette, the mid-cabin located beneath the dinette with a queen size mattress, and the forward master stateroom with island bed with a memory foam mattress. 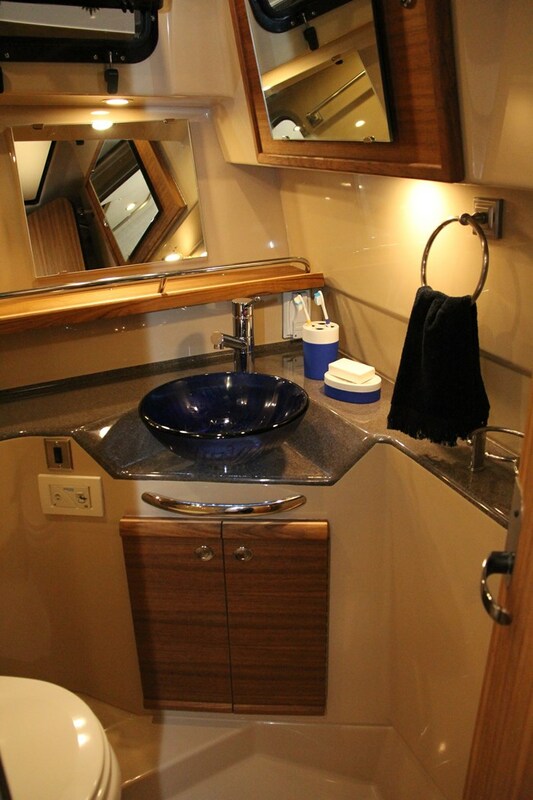 The forward starboard side head compartment comes complete with electric head, vessel sink, and shower with enclosure. The port side galley is well equipped with dual burner electric stove with oven, stainless steel sink, microwave, plus refrigerator/freezer. A single hinged passenger seat mounted on the forward edge of the galley countertop flips forward and down to create additional counter space. The cabin sole is teak and holly overlay. The standard equipment list on the R-29S is exemplary including such features as bow pulpit with built-in telescoping beaching ladder, electric anchor windlass, raw water washdown, bow and stern thrusters, trim tabs, electronic engine controls with vessel monitoring display, cabin heater, tank level monitors, dual pantographic windshield wipers plus defroster, a six-bottle wine/water cooler, remote spotlight, 22” TV/DVD in both the master stateroom and salon, Fusion stereo system with eight speakers, Garmin VHF, plus vinylester hull barrier coat. Notable optional equipment includes a wide selection of Garmin electronics including chartplotter, radar, weather, autopilot, and AIS 300 or 600 Automatic Identification System, two units of reverse cycle air conditioning/heating, diesel generator, propane stove and oven in place of the standard electric unit, Webasto diesel forced air heater, cockpit ice maker instead of the standard refrigerator, underwater lights, swim platform safety rail, and even a 140 watt rooftop solar panel, aft station steering, plus a RIB inflatable with weaver davits and winch. The R-29S – a new model and a new design with added flexibility and lots of new and exciting features.